Only 12h 57m 9s left! I am about to pull my hair out! I have done this scene...figure, water, stones...I have set up sky lights. Sun, spec and HDR. I want to have light as if through leaves. This use to be easy. 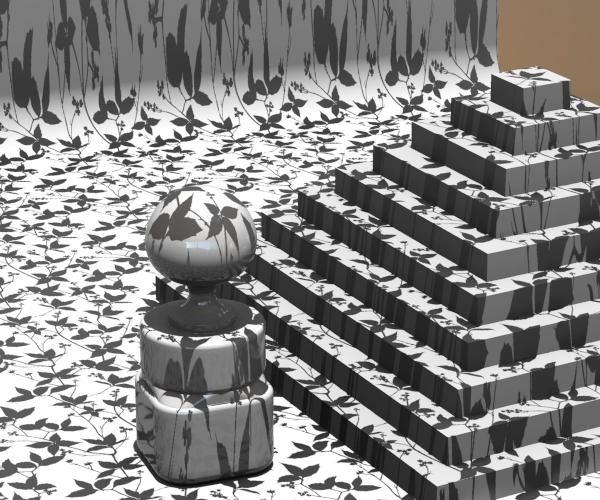 I did a square, did a black and white map of leaves and used it as a transmap and the light would caste the shadows. SO I thought, ok Ill use it like a gel on the light...it did caste shadows but oddly..on the figure the shadows were great..but behind her on the stones the shadows were smaller and too dark....as if the tile was smaller there. 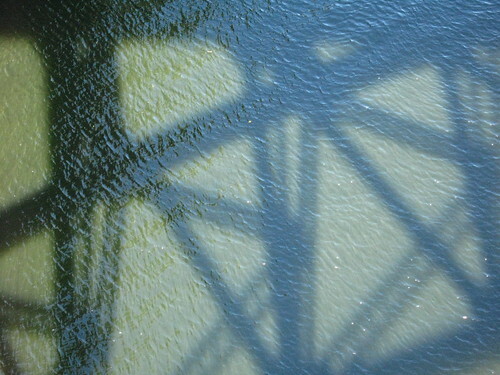 I also noted the water was not getting any shadows on it. 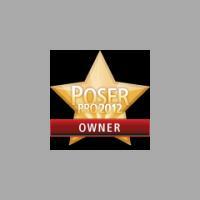 I am using pp2012 on windows 7 64bit. ANYWAY (short of having trees in the shot..which didnt work either btw) of getting even, shadows for this? 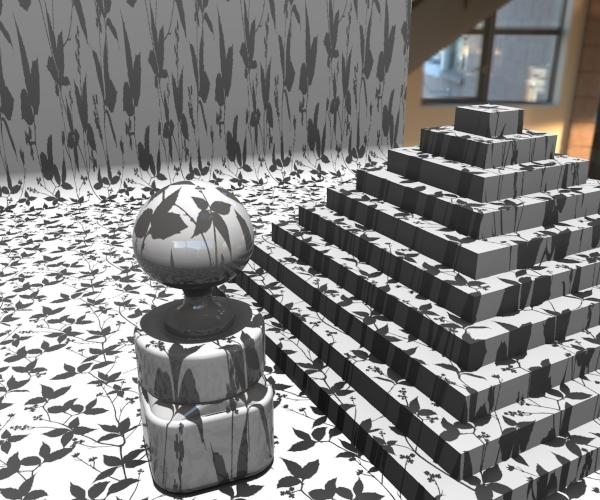 with raytracing on and raytraced lites, transmapped objs (e.g. 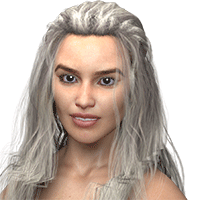 hair, leaves) will cast shadows (slow render). 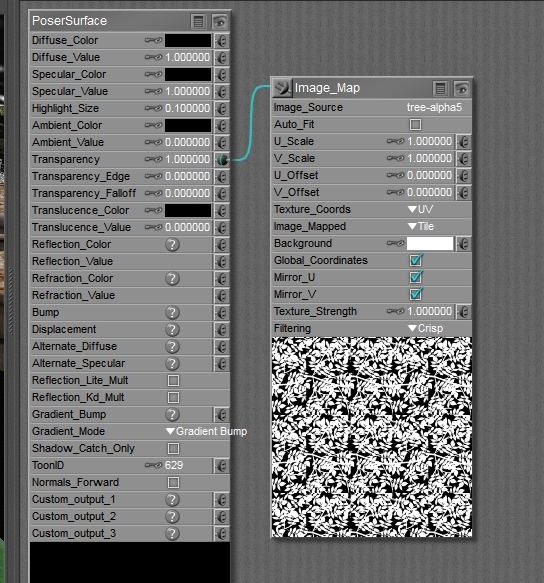 will also work with poser 4 depth-map lites if you know how to use 'em. 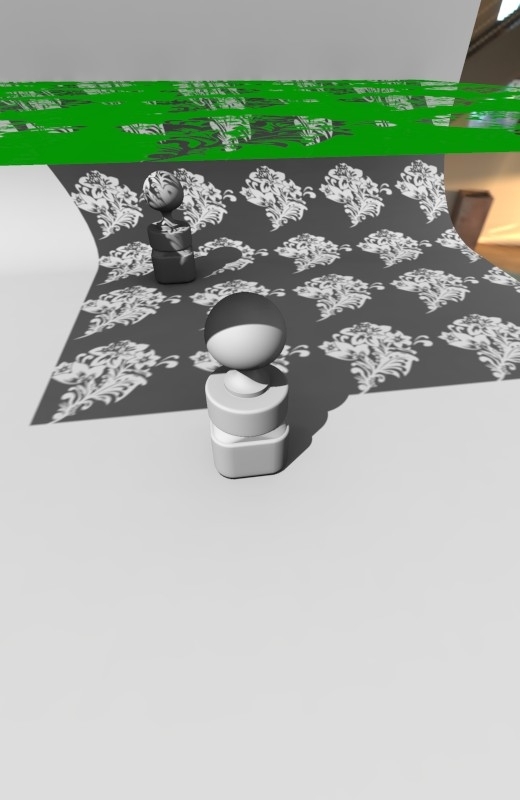 it still not leaving "leaves shadows". 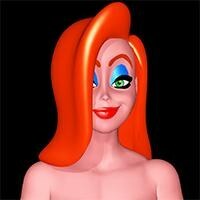 Could you show us a couple renders to help us understand? Without a picture, I'd have to guess that you don't know what you don't know. Either you've set it up in some strange way that you didn't tell us, or you're misinterpreting what equally spaced shadows really look like when perspective and angles come into play. I set up a gel on an infinite light here, with a repeating leaf mask. 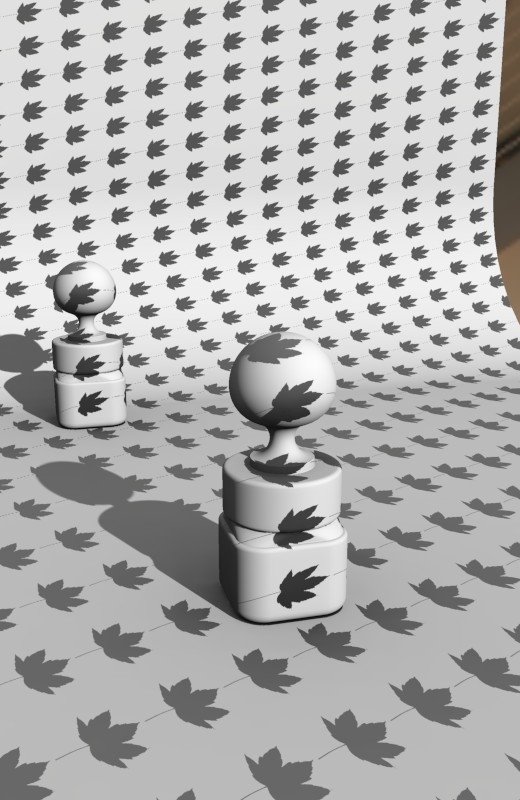 No matter where I place my pawns, they seem to be covered by five leaves, and exactly the same number are missing from the curved background prop. I see no evidence that the repeats are in any way changing from one object to another. Also, a one-sided square with a transparency mask on it works exactly as I'd expect, letting light pass through only where it is transparent. My last post did not appear even after refreshing many times - perhaps adding this post will make it appear. I knew I should not come in here. I knew it. If this shows up, whoever is reading it, you need to understand that it did NOT show up when I wrote it. o.0 Ok this is how the set up goes. Then we have a partcial render(just to save time from it trying to do the whole thing...it shows the lack of shadows I am talking about) this is with a square set between the figure and the "sun" and using an alpha map to try and caste "leaf" shadows its not too bad on the form in front of her..but its not what I need on her nor the water. So I need to get the shadows as lovely as they are on -her- and I need something on the water surface to show the leaf shadows. In reality, unless the water is really scummy I don't think you'd get much of a shadow cast on the water surface. You might get reflections of the dark leaves against the sky, but that's not the same thing. the water has to be quite murky for shadows to be visible (and the shadows are on the murk, in the same way as you can get shadows on smoke or fog). I've just been in my kitchen with a flashlight and 2 mugs of water, one clean, one murky (diluted leftover milky coffee). To get a visible shadow on/in the water it has to be so murky that you can't see the bottom of the mug. As you dilute it with clean water the shadow gets weaker and then fals directly on the bottom of the mug. 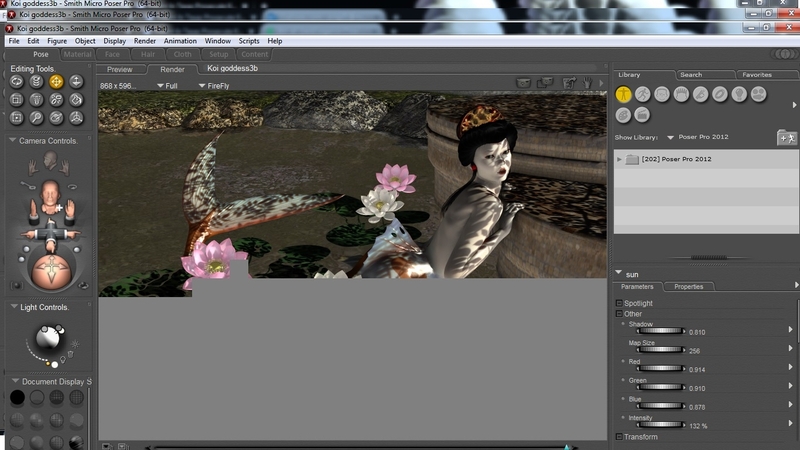 Can Poser render murky water? I've never tried. The square setting is wrong because you also enabled the falloff transparency, thus it becomes completely transparent as the angle of incidence decreases. You should either set Transparency_Falloff to 0 to disable the Transparency_Edge, or configure Transparency and Transparency_Edge identically. You have the same number (1) but you did not connect the image to both so the strength of your shadows will approach zero if the camera is "looking" at that square edge-wise (even if we don't see the square). Once you correct this, the square will produce consistent shadows just as the gel does. 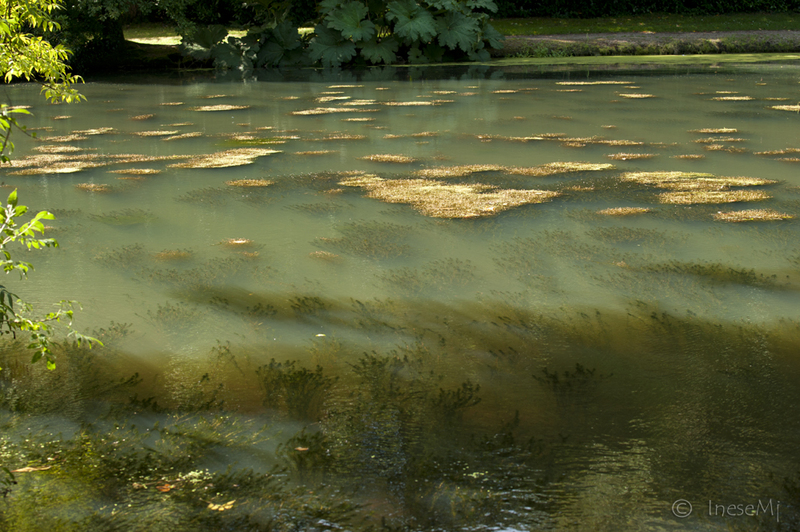 For pond water, your shader must have some diffuse in it, and it looks to me like you are not doing the Fresnel effect properly so it looks pretty fake. 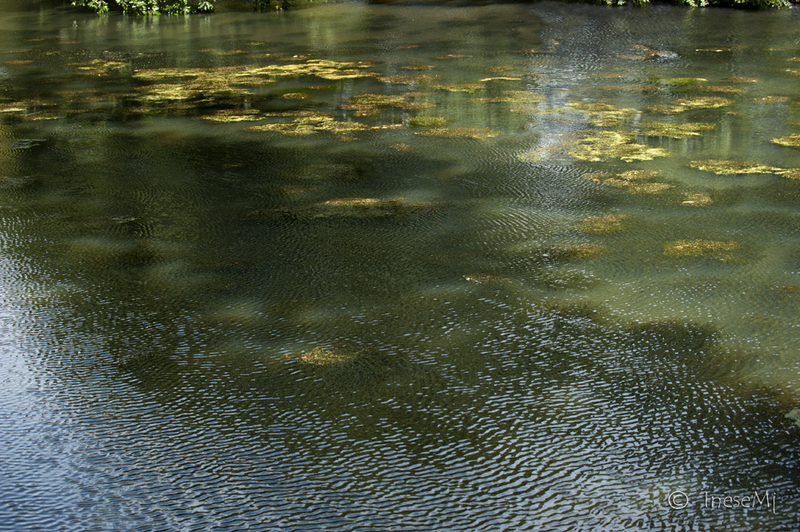 There is a recent thread where I posted a lot of links to water tutorials - one of them discusses murky pond water quite a bit. 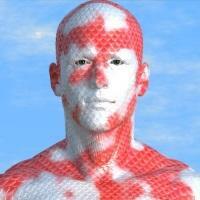 Go to the thread "on rendering water" and you'll find the links. The one where I wrote (pond, lake, river) is where you want to go but I suggest you read all of them. One of the threads I linked to has this particular post which discusses more options for rendering volumetric shadows in water. this one has muddy waters. shadow seems to scatter down, but I don't recall settings. probly diffuse, but scatter may be better if it weren't just single surface. It's clear to me they're doing exactly what they're supposed to. The reason the leaf shapes are stretched out on the figure is because her skin surfaces are nearly vertical. Put a flat box right above her shoulder and render again to see how small the projected shadows really are. Then progressively tilt that to be more vertical and render again. "probly diffuse, but scatter may be better if it weren't just single surface." Yeah but let's not complicate the matter. We've got 3 things wrong already that are actually Poser 6-level basic stuff. You're peeling the 4th layer of the onion a bit early. The information I'm linking to is from 2006!!! I also see you have GC enabled, but configured for Gamma=1. This effectively disables GC. Not sure what you're trying to do but that setup is neither on nor off. Of course I'm going to point out that you're going to struggle and tweak and constantly test render (unlike me, where I render once and done) if you render without gamma. oops! sorry bout dat! I ain't got P6. thx fr explanation of leaf shadows. ok I changed the settings on the square. this is the outcome so far and here is the new settings on the square its still not like the "gel" light I made. Am I doing something wrong still? I love the look of the "gel" shadows but...they are odd on the rocks etc. Perspective and angles have a dramatic impact on perception. I really think you should work with some simple white props until you have a firm grasp of what to expect. Also - this has the benefit of producing a render in 10 seconds or less which permits vastly more effective experimentation. Here is a scene I set up with a gel similar to yours. 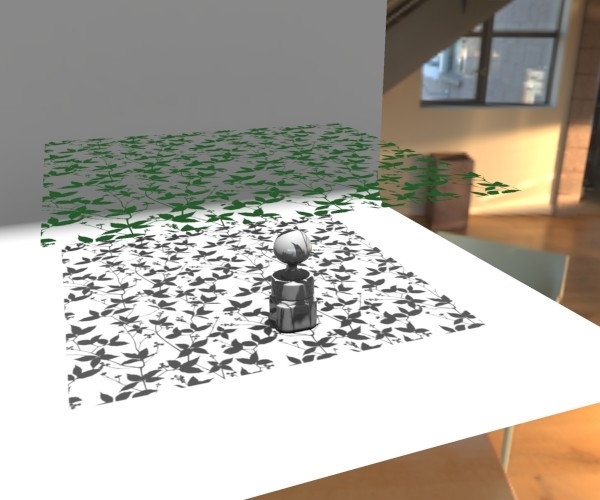 Two renders with different camera focal lengths and perspective (position) reveal a big change in the apparent size of foreground vs. background shadows. If this isn't clear to you, then do 100 renders like this - your brain will learn what to expect without you thinking about it. 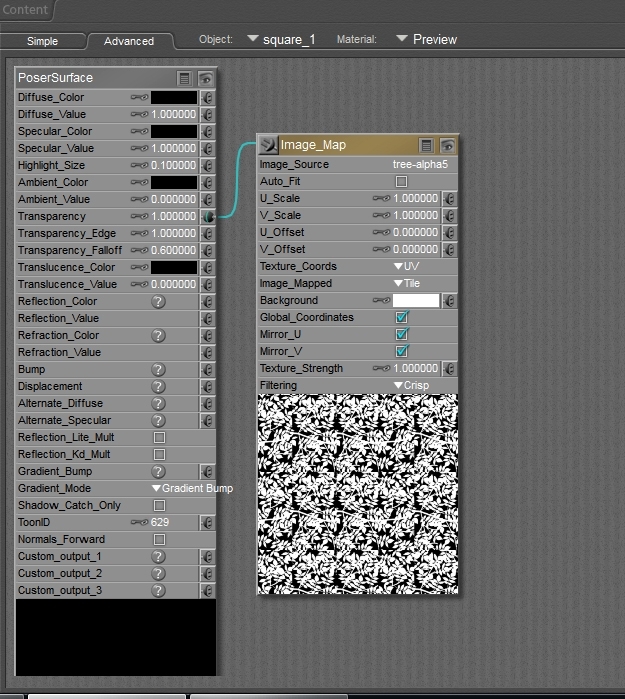 :S I was using suggested render settings. "its still not like the "gel" light I made. Am I doing something wrong still?" Probably. You're not telling me what you're doing. I can only guess. You forgot to enable raytracing. The "Shadow" setting on your light is 0 - should be 1. I'm pretty sure it's something like that because you haven't got any shadows at all, anywhere. You'd notice if you'd just do some simple white-object tests instead of dealing with a thousand complexities. I also can't see where you've placed your square so I can't tell if it even is in the right location. but on the latest one I did...I cant get the shame effect with just using the square infront of the light to caste shadows. Is there anyway to get this gel look with using the square? also I am going to change the water to your settings...but will it allow part of her tail being visible? in the one I am using its distorted like water but still slightly visible. Regarding your suggested settings - the right settings depend on many things. 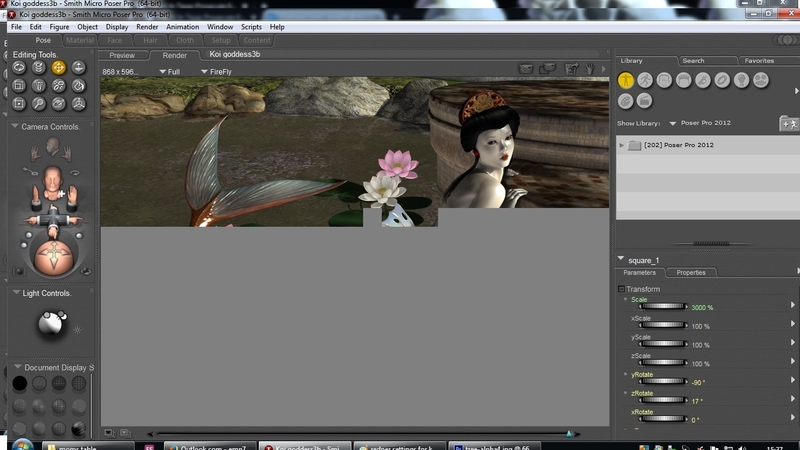 But for speedy test renders those are horrible. Make the following changes to speed things up until you're ready to do a final render. Using the settings you had my test render was 97 seconds. After these changes it was 7 seconds. 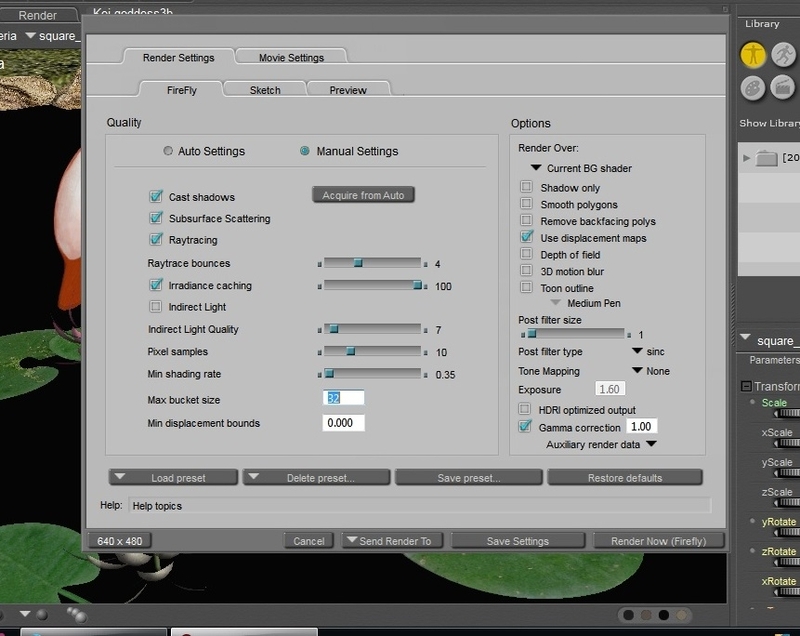 here are the render settings. here are the light settings for the "sun"
I am also going to try and do a white scene like you suggested to try and get this working. Yes obviously there is a way. I've shown you examples. I have no clue where your shadows are because you have NONE - not just missing for the square - missing altogether. Why do you have no shadows? I don't know - show everything. Or - send me your file. The shadow strength is not 1 - it should be 1.